I hadn't heard of Disney's Bolt until my friend Sky reviewed it over at her blog. (This is the part of the review where Jennifer laughs at me for living under a rock.) We don't have television reception or cable or anything. We don't take a newspaper. We get our news from the internet. If CNN homepage doesn't report it or you bloggers don't say it, it may take me awhile to hear about it. (Somewhat pathetic but I'll take the trade off any day.) Just because we don't have tv in the "traditional sense" does not mean that we do not watch tv. We just do our watching via DVDs where there are no commercial interruptions. Anyway, based on Sky's glowing recommendations, I knew I wanted to see this movie. It took us two weeks to even find a copy to rent. Obviously this movie was popular! I began to despair of our ever seeing it. At the same time, while I waited, I had great hopes that it was going to be something fabulous! I'm happy to say that my hopes were justified and not dashed. I loved this movie! The film's plot centers around a small white dog named Bolt who, having spent his entire life on the set of a television series, thinks that he has super powers. When he believes that his human, Penny, has been kidnapped, he sets out on a cross-country journey to "rescue" her. Once Bolt is off the studio set he begins to notice that his super powers aren't working. He mistakenly believes that this is due to the effects of styrofoam - which he has never heard of before and only recently came into contact with. He freaks out and comes to grips with reality with the help of a cat named Mittens and an incredibly hilarious hamster sidekick named Rhino. 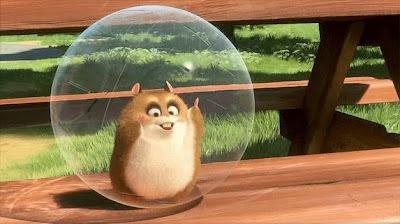 The hamster, by the way, was my favorite character as I previously predicted he would be. Our concern in movies that we would consider showing him is that they will be too dark in mood or content. The movie opens with some action scenes, depicting the way of the tv show that our young hero of a dog is involved with. There are helicopters and motorcycles and several explosions. 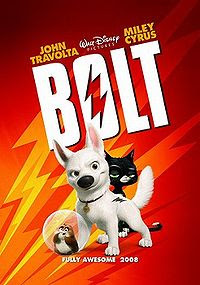 After the first 15 minutes though the movie relaxes into a cross-country adventure of Bolt trying to find his person with a rather cynical cat and with the wit of a hamster. Superbly done. We really enjoyed this movie and I did not note anything objectionable about it. We weren't sure how Bookworm1 would handle the first bit of action but he seemed only delighted and not bothered at all. I thought Disney handled the suspense aspect very well so as not to come across frightening at all - just over the top funny. That's how it played off with us and it went over very well. We were happy with it. Thanks, Sky, for mentioning it so that we could find and enjoy it also! I guess we live under a rock as well. We don't get tv reception (and definitely don't want to pay for cable), and we just watch DVDs. As for the news, I usually find out about it only when it pops up online. My family LOVED Bolt as well. It is a great movie...I think it is worth owning as it is one of those fun movies that will make you laugh every time you watch it! We liked it so well we showed it to my in-laws and they loved it too! It really made either day. : ) Everyone should see this movie! I keep replaying this blurb about the Hamster that i found on Youtube and it makes me laugh every. single. time. So accidentally, I did "dog themed" Easter baskets for the kids. They each got a stuffed animal puppy, and Samantha received this movie (per her request)! And the timing was perfect because we had just been at Disneyland all week where they saw Bolt everywhere. We watched it just yesterday, and it really is precious. And the hamster is a total crack up. I NEED to live under a rock, and am psyching myself up for turning off the tv for the national event next week! Thank you -- I'm always looking for movies to add to our Netflix queue that the whole family can enjoy! I just heard another great first-hand review of this movie, so we'll be renting it for sure. I hope it's okay... I linked you into today's Monday's Movie Mr. Linky!